Abstract: Molecular probes have found wide application in the study of biomolecules within living systems. 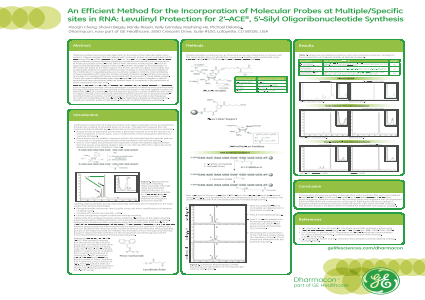 Oligonucleotides that are labeled with molecular probes are an invaluable tool for monitoring DNA and RNA processing for both in vitro and in vivo applications. Solid-phase oligonucleotide synthesis facilitates relatively straightforward and efficient incorporation of molecular probes at the 5'-end of DNA or RNA. However, modifying the 3'-end of an oligonucleotide generally requires either post-synthetic strategies or immobilization of the molecular probe to the solid support. The former process is subject to low yields due to potentially inefficient coupling while the latter strategy is restricted by the stability of the modification to repeated exposure to synthesis reagents. Similarly, internal labeling of oligonucleotides with molecular probes is largely limited to post-synthetic processing and subject to coupling efficiencies associated with this process for these labeling steps. Finally, the need to differentially label oligonucleotides with distinct moieties in specific terminal and internal positions adds yet another layer of complexity in the generation of these important molecular tools. In order to improve the labeling efficiency and ease of preparation of internal or 3'-terminal sites of oligoribonucleotides, we have developed a method for labeling these positions while the oligonucleotide remains immobilized on the solid support. We have applied a method to selectively de-block a levulinyl-protected hydroxyl group at a variety of different sites within an oligonucleotide and to selectively label these positions by the use of phosphoramidite activated molecular probes. Conditions used to remove the levulinyl protecting group are mild and compatible with the 2'-ACE®, 5'-Silyl oligoribonucleotide synthesis platform, resulting in excellent yields of high quality, full length modified oligoribonucleotides.Summary: A unique method that uses a levulinate ester as a protecting group to introduce conjugates or molecular probes to virtually any location in a synthetic RNA molecule is discussed. The Levulinyl protecting group is stable in RNA synthesis conditions and can be removed without affecting the other parts of the synthesized RNA. We show the capabilities of this approach with three high-complexity synthesis examples. References: 1. S.A. Scaringe, F.E. Wincott and M.H. Caruthers, Novel RNA synthesis method using 5'-silyl-2'-orthoester protecting groups. J. Am. Chem. Soc., 120, 11820-11821 (1998). 2. S.A. Scaringe, D. Kitchen, et al., Preparation of 5'-silyl-2'-orthoester ribonucleotides for oligonucleotide synthesis. Current Protocols in Nucleic Acid Chemistry.